All art is experimental. For the painter at an easel, for a potter at the wheel; in the bold leap from idea to physical form there is an element of chance, the constant hope of giving shape to a burning concept and the ever-present possibility that the vision may not be realised. Over the last decade Simon Maberley’s work has focused on figurative sculptures in glass, with occasional forays into more cerebral aspects of his practice. His latest work warrants the experimental moniker but this is perhaps a hasty label. While he appears to have taken a bold direction that may come as a surprise to some, Maberley is clear that he remains on much the same path as ever, divergent yet in happy parallel to his practice as an object maker. While undergraduate studies at the Sydney College of the Arts afforded him a strong conceptual background and a broad technical knowledge, it was his Masters degree in the United States that enabled him to further explore the limits of glass as a medium. Maberley was consistently drawn to explore conceptual ideas, despite his burgeoning commercial career as an object maker. 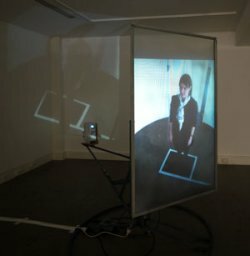 It was here he began to look beyond object-based aspects of his practice and immerse himself in cross-media and performative work. Particularly recurrent throughout his oeuvre were notions of representation, and investigations into the theory and philosophy of body and identity that drew metaphors from the characteristics of glass as a medium. For artists with unwieldy concepts the technical conventions associated with glass can be problematic. Only recently has it become more commonplace and widely accepted for practitioners to cross boundaries and straddle the invisible divide between ‘glass artist’ and ‘contemporary artist’. That’s not to say Maberley’s connection to glass has been severed. This revered material, originating from near magical processes, often goes largely unnoticed in the fabric of our everyday lives, and this quiet prevalence is of great interest to Maberley. By using ‘found’ glass – a windowpane, a mirror, a camera lens – he draws attention to the way the material is used in the technology of our everyday lives. The components of the exhibition Reflection are a meeting of many of these glass elements. A large white cylindrical structure sections off the gallery. It is tidy and clinical, yet welcoming; its curtained door reminiscent of a photo booth or change room. Visitors are invited to step through the curtain and into the centre of the well-lit space. 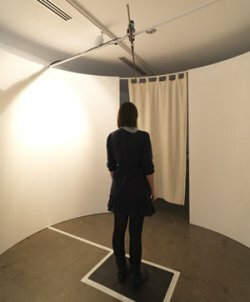 Their arrival triggers sensors, and overhead a camera begins to whir around the circumference, deftly and methodically mapping the booth’s visitor. Once the rotation is complete the subject is free to step out of the booth and enter into the gallery proper. Here the majority of the space is inhabited by a complex, perhaps even whimsical structure. With lumbering grace it spins a projector and glass screen upon an axis, its mechanics laid bare for consideration. Following a fifteen second delay, the image transmission travels from the booth to become a sweeping 360 degree projection into the gallery space, the image of the booth’s visitor writ large across the walls. Watching the recorded footage we are reminded of the extremely limited knowledge we have of how we really look. In photographs, in the mirror, or even a snatched reflection we are self-aware and self-edited. This projected ‘three dimensional self’ is surprising, amusing and quite confronting. (Do I really slouch that much? Is my nose really that big?) Unlike looking in a mirror, the time delay between capture and projection disables our natural instinct to ‘correct’ and ‘adjust’ the image of ourselves as we see it. Without immediate access to our reflection we are not dictating appearance, so this 360 degree and unorchestrated view realistically depicts the self we present to the wider world. The sudden unfamiliarity with our own image is striking – we know so many things about the world we’re in, and yet, we hardly know the back of our own heads. There is a seed of the way it must have felt to have first discovered your reflection as a child. In this way Maberley reintroduces an element of fascination to technology, much of which is no longer surprising or awe inspiring. In the era of screen-based communications such as Skype the face-to-face view is more prevalent than ever while the human body becomes ever more obsolete. Though we inhabit our physical form our consciousness is removed, ‘uploaded’ and shared on the alternate reality of the internet. This metaphysical migration is endlessly fascinating to Maberley, who wonders in turns: where are we going? What will the next step be? And furthermore, what materials will play a part in taking us there? the most concise incarnation of these ideas to date, the entire apparatus and onus of the show directed only towards bringing the audience’s attention to itself. Reflection is not about the artist; rather it is all about us. Audience interaction remains optional, but without a participant the work is incomplete and idle – the individual completes the circuit. Without dictating a level of involvement, or pre-prescribing a response, Maberley appeals to his audience to satisfy their curiosity and gain further self-knowledge. Reflection becomes a gentle allegory for latent socio-political concerns, encouraging participation, stimulating thought and advocating action. This essay accompanies the exhibition Reflection at CraftACT Craft & Design Centre. The exhibition continues until September 25th.